This new Free-Floated Carbon Fiber forearm is in the triangular shape, (Delta) configuration and was designed to work with most piston or op-rod systems out in the market today. The Delta forearm uses the same easy locking system as the original round tubes. The forearms come in Black or Dark earth colors. 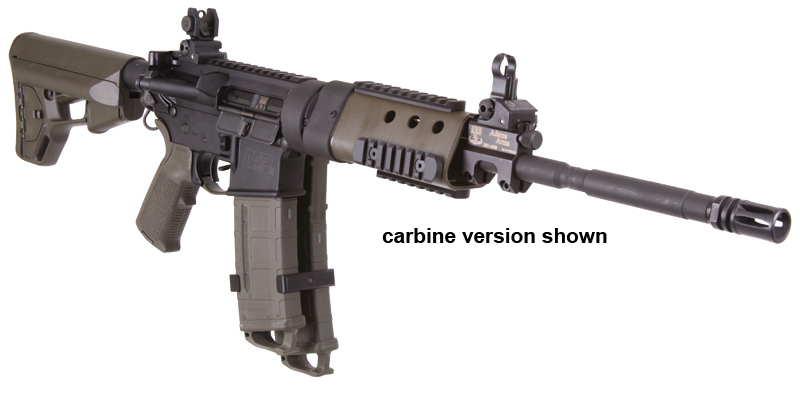 The forearm comes with 4 rails, 8.5" rail on top and then 3 3" rails at 3,6 and 9 O'clock postions. The forearm is constructed of wrapped carbon fiber, with an aluminum barrel nut and collar. Total length of the forearm is 12.5" and weights 15oz. including barrel nut. The clearance from the center line of the barrel to the underside of the forearm is 1.1". The receiver and the rail on forearm are not at the same elevation. The Inner diameter of the barrel nut is 1.020" Custom barrel nuts with larger ID for larger diameter barrels can be made. Please call.